Parliament was set to convene at 1.30 pm this afternoon. However, proceedings of parliament are yet to officially begin. A large number of UPFA members of parliament have surrounded the Speaker’s chair. MP Arundika Fernando is currently seated in the Speaker’s chair. 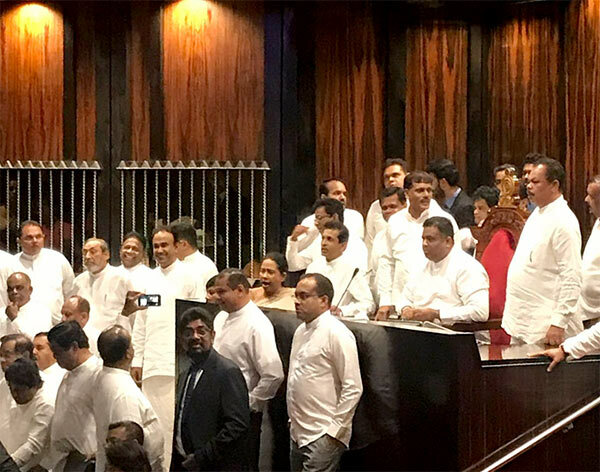 The MPs are protesting against UNP members Palitha Thewarapperuma and Ranjan Ramanayake bringing knives into the chamber yesterday. JR made a mistake thought ,future politicians will be like him or Ranil . Wandurata Deli pihiya Denna Epa kiyala .